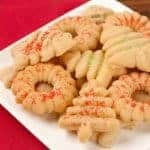 Rich, buttery spritz cookies are a classic favorite, and with the help of good quality cookie press you can easily make a big batch for gift giving and entertaining. Gently form the dough into a log shape. Following the manufacturer’s instructions, fill a cookie press with the dough (you will probably need to work in several batches) and dispense the cookies at least 1 inch apart onto ungreased baking sheets. Bake for 10 minutes, or until the cookies are lightly golden. Sprinkle with colored sugars and cool on wire racks. Store in an airtight container, up to 3 days at room temperature, 1 week refrigerated or 1 month frozen.